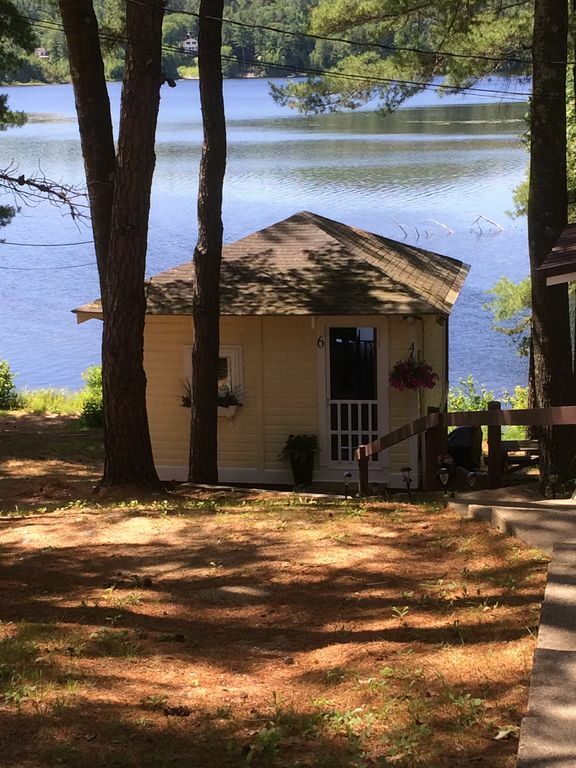 This cozy cottage sits 20 ft from Pequawket Pond. We are the only cottage in this association that has 2 floors right on the pond that has a bedroom downstairs with walk out access. We are located with in minutes to the Mount Washington Valley and all the amenities the valley has to offer as well as The Kangamangus Highway and most ski resorts. This cottage has been newly remodeled inside and out and decorated, We completely updated This Cottage to offer a small kitchen for your family. We also have an electric fireplace for a more romantic time. Our cottage offers a queen size bed with bunk beds down stairs as well as a pull out daybed on the main floor. Guests may also use our gas grill and fire pit. So after a day of great skiing, shopping and site seeing come and relax by the fireplace. Please park at “Guest Parking” areas as marked. Only 1 car allowed and when parking please park up the hill to the left then the far left away from other cottages. *NO SMOKING IN THE COTTAGE OR ON COTTAGE PROPERTY per the condo rules. If you are caught smoking you will be asked to leave the property and they’ll be no refunds. I was only there for a weekend , but wished I could have stayed longer ! The cottage is absolutely adorable. The downstairs stayed dark and cool ... great for sleep . The upstairs was cute and cozy. My favorite part of the cottage was absolutely the view! Tons of great places to hike .... which was my main reason for the stay. I didn’t meet the owner , but when I arrived there was a basket of treats and bottle of wine in the kitchen , which I thought was really nice .... he also sent me an email ...which was clear and concise... which was great. There were also plenty of pots , pans etc there , which is really convenient if you are there for a longer stay. Had a wonderful time ! Great space, great location, and great value! We had a great stay! It was the perfect space for our family of 4. The location was great and we enjoyed the cottage. Great value! Great spot for a respite. We live in the city, so John’s place was a perfect getaway. We saw lots of wild life and the cabin had everything we needed. The heat works well, tv, Internet, all good. John is an accommodating host; he left coffee and individually wrapped pastries, as well as bottles of water for us. Great place, highly recommend! I can't say enough great things about this rental. I couldn't take enough pictures of the view! Everything was clean, and we had everything we needed there. We even took the kayak out. The proximity to the White Mountains was perfect since we loved the waterfalls and hiking in the area. What a quiet relaxing stay. We would highly recommend! !